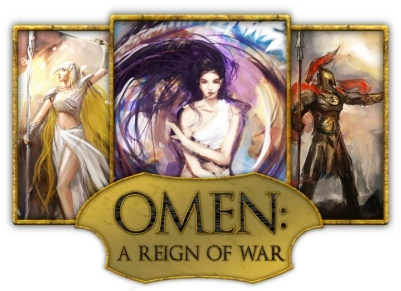 ZOMG, Pre-orders went live this week for Omen: Reign of War!! This is a STUNNING two-player card game from Small Box Games. They are only making 1000 copies, so most who would like copies will be pre-ordering them now. For twenty bucks, I couldn’t resist. The game itself is a 2-player war game. Players use units of soldiers, spirits and beasties to gain rewards and accomplish feats for victory! Lots of neat card interactions in this. This entry was posted in Board games, news and tagged 2-player, 2-player games, Board game, board games, boardgames, Card game, Game, Gameplay, Games, omen, omen: reign of war, preorder, small box games. Bookmark the permalink.